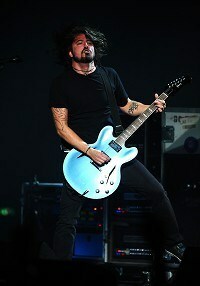 The band used the rocker's garage as their second home, where they worked on their seventh album, Wasting Light. "I asked my wife Jordyn if it was OK and she was really cool about it," he told The Sun. "She knows that this is my life and how important it is to me and it brought everyone in even closer. My kids became a part of every day and my band members became friends with my kids. In 20 years when they're two grown women, these guys will probably be telling them stories about the time they came up and made coffee for everyone." Dave's daughters - four-year-old Violet and 23-month-old Harper - even featured in footage in the new film Foo Fighters: Back And Forth, which opens in cinemas from April 7, and the rocker credits this family time. "That was the joy of being at home. Spending time with my girls and everyone bringing their kids over. We're on the road so much that it's important to spend every minute we can with our families," he added.